U. MICHIGAN / U. PENNSYLVANIA (US) — Wild gelada monkeys change their behavior to avoid getting caught cheating on sexual partners. While females typically only mate with the dominant leader male of their unit or harem, the opportunity for infidelity always exists. 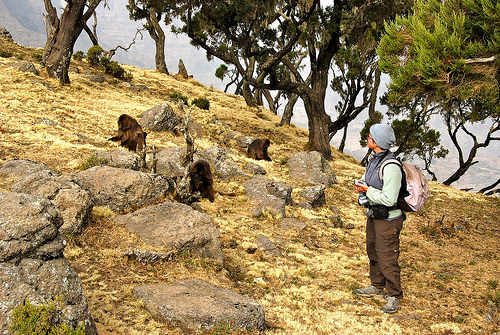 Subordinate follower males hang out with some of the units, while young bachelor males are also hovering around the edges of every gelada herd. But monkeys that try to commit adultery while deceiving the leader male have to first overcome an obstacle presented by their open grassland habitat—there is simply no place to hide. For three years researchers noted the details of the sexual behavior—and misbehavior—of more than 200 wild geladas. They suspected that cheating geladas might still try to conceal their indiscretions despite the lack of secluded rendezvous spots. Leader males and females typically give loud calls while mating—a vocal duet that can be heard from more than 30 meters away. Therefore, the simplest way for cheaters to avoid discovery is to stay quiet and keep an eye on the whereabouts of the leader male. After carefully studying more than 1,000 sexual relationships among geladas, they found that cheating individuals do, indeed, make sexual noises less frequently. Most cheating between the female and subordinate happened while the leader male was at a safe distance away. This combination of behavior suggests that the couple tactically alter their behavior to avoid detection. 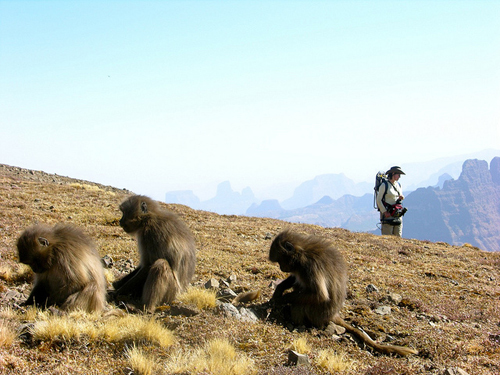 Published in the current issue of Nature Communications, the study also shows that cheating has consequences: the leader male violently chased the follower male and female apart. This aggression was not direct competition, as the leader male seldom mated with the female after the attack, but most probably the leader males punishing cheaters whenever they can. “By studying the existence of both deception and punishment in the wild, especially among primates, it allows scientists to better understand cooperative and competitive strategies,” says Thore Bergman, an assistant professor in psychology and in ecology and evolutionary biology at the University of Michigan. Aliza le Roux of the University of the Free State-Qwaqwa is the study’s lead author and researcher. The study’s other authors are Noah Snyder-Mackler of the University of Pennsylvania and Eila Roberts and Jacinta Beehner of the University of Michigan.